Already a commercial giant, China is aiming to be the world's next great power. Will that lead to a confrontation with the U.S.? 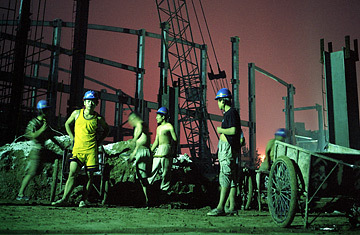 Chinese construction workers work on a structure that will be used during the 2008 Beijing Olympic Games. The railroad station in the Angolan town of Dondo hasn't seen a train in years. Its windows are boarded up, its pale pink façade crumbling away; the local coffee trade that Portuguese colonialists founded long ago is a distant memory, victim of a civil war that lasted for 27 years. Dondo's fortunes, however, may be looking up. This month, work is scheduled to start on the local section of the line that links the town to the deep harbor at Luanda, Angola's capital. The work will be done by Chinese construction firms, and as two of their workers survey the track, an Angolan security guard sums up his feelings. "Thank you, God," he says, "for the Chinese." That sentiment, or something like it, can be heard a lot these days in Africa, where Chinese investment is building roads and railways, opening textile factories and digging oil wells. You hear it on the farms of Brazil, where Chinese appetite for soy and beef has led to a booming export trade. And you hear it in Chiang Saen, a town on the Mekong River in northern Thailand, where locals used to subsist on whatever they could make from farming and smuggling--until Chinese engineers began blasting the rapids and reefs on the upper Mekong so that large boats could take Chinese-manufactured goods to markets in Southeast Asia. "Before the Chinese came here, you couldn't find any work," says Ba, a Burmese immigrant, taking a cigarette and Red Bull break from his task hauling sacks of sunflower seeds from a boat onto a truck bound for Bangkok. "Now I can send money back home to my family."